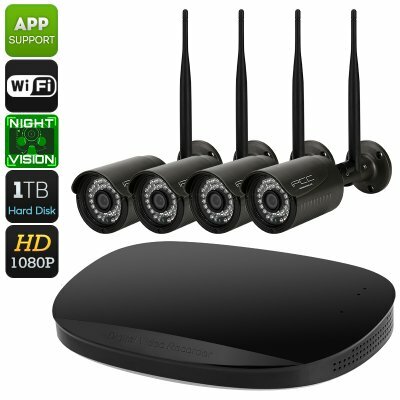 Successfully Added WiFi NVR Kit - 1080p Full-HD, IP66, IR Cut, 30m Night Vision, 4 Cameras, App Support For iOS And Android to your Shopping Cart. Significantly upgrade the security of your property with this 1080p WiFi NVR kit. Coming with 4 high-end Full-HD cameras that feature a tough IP66 design, this NVR kit can be used perfectly for both indoor and outdoor security. By supporting WiFi connectivity, the 4 cameras of this NVR kit can be easily and efficiently placed anywhere without any restrictions caused by internet cables. Thanks to this, you’ll be able to fully optimize your property security and easily adjust the positions of your cameras whenever needed. Each camera features a 1/2.7-Inch CMOS sensor thanks to which it provides you with clear Full-HD 1080p video. Supporting a viewing angle of 73-degrees, you can be assured that each camera captures anything that’s happening within its surroundings. Additionally, It comes with 30m night vision capabilities and supports IR cut meaning it will automatically switch to night vision whenever light is low. With this WiFi NVR kit at your disposal, your property will be fully protected at both day and night. All recordings will be automatically featuring the time and date of when the video was taken. Thanks to its abundant network protocol, you will be able to access your cameras and previous recordings from afar. By supporting its own mobile application, you’ll even be able to check the security level of your home or office via your iOS or Android smartphone. With up to 1TB of internal memory for every camera and different recording modes, you can be assured that from now on your property will be safe at all time. This WiFi NVR Kit comes with a 12 months warranty, brought to you by the leader in electronic devices as well as wholesale electronic gadgets.. This combo unit is very easy to setup, easy to use, and the picture is very clear.